UPDATE: Lost Art #8 has been found! Cherise Roberts Decker has found this painting and put in the window of her business, Gateway Abstract on N 7th street in Stroudsburg, PA! Thanks so much to Cherise for claiming it. It's the first one so far to be discovered and reported, so it will always have a special place in my heart. 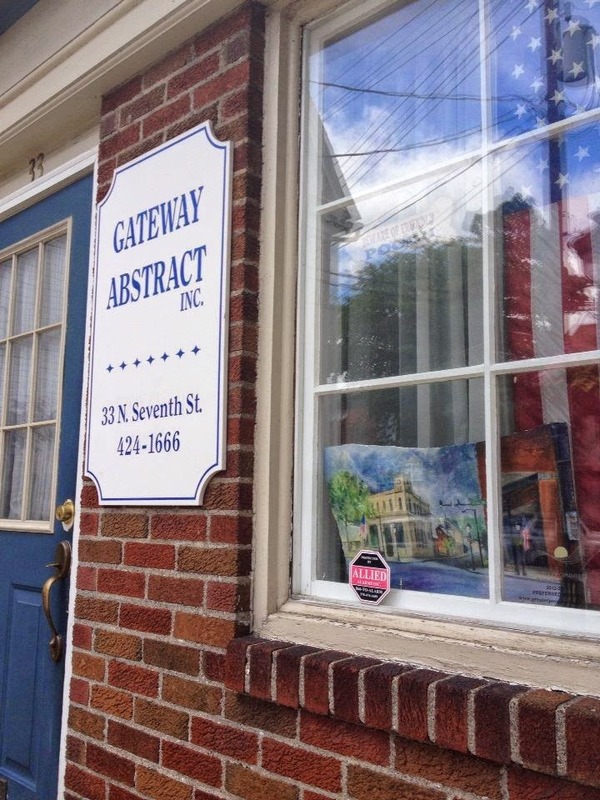 If you live in Stroudsburg, you can drop by Gateway Abstract and give my regards both to her and to the painting! Cherise was kind enough to send in this picture of the painting in its new home. Below is the original post. Lost Art makes its third appearance in the United States today. This time, it's on Main Street in Stroudsburg, Pennsylvania, at the corner of North 7th Street. Having grown up in Stroudsburg, I'll be interested to hear if this one gets discovered by an old friend or neighbor :). This will be the last painting in the US for some time, as later today I'll be heading to the airport and back out of the country for a few months. So if you're in the Stroudsburg area, this might be your last chance for a little while! But never fear. I'll be returning again someday soon. And if you're looking forward to the series continuing back in Europe, you'll be hearing from me in the coming days! 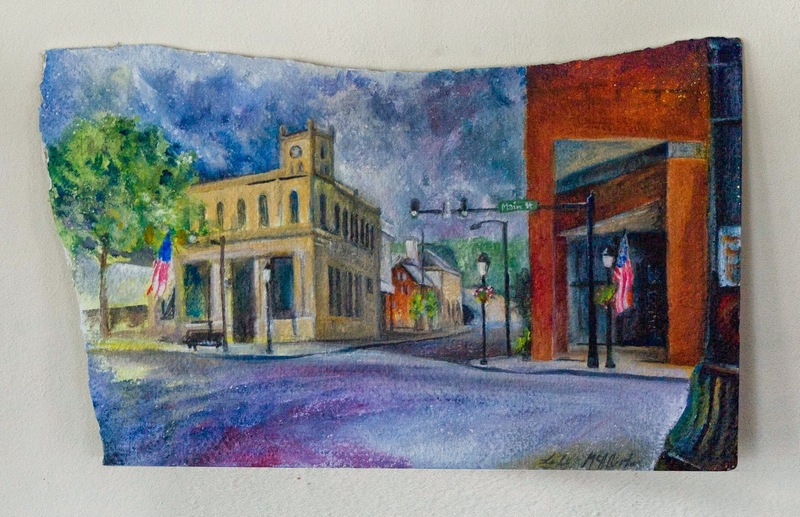 This painting, acrylic on found cement board, 21 3/4" x 14", was left on Main Street in Stroudsburg, PA, on June 26, 2014 at 11:30 am. I'm so glad that you found it and that you've given it a home! This is particularly exciting for me because it's the first official "find" that I've heard back about since the project began. So it's quite an occasion to celebrate! This will definitely help inspire me to keep going. And thanks so much for sending in the picture of the painting in its new environment! I might add that to the blog as well! 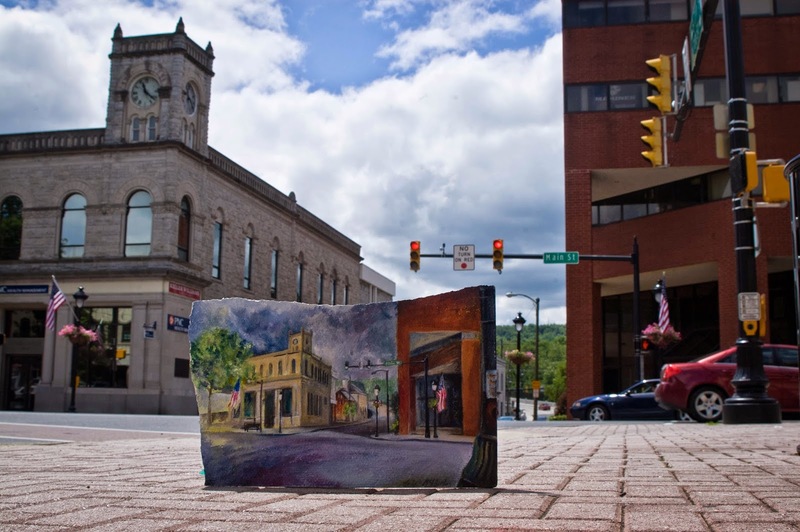 Laura Goss of Pocono Arts Council found it also, today! Great stuff, Leslie. Love that "thinking outside the box" creativity! That's great! Thanks so much for letting me know! I'm so happy to hear that people are getting a kick out of it. Anybody who finds one they like is welcome to take it home with them! I'm hoping to do some more in the Stroudsburg area when I come back in a few months. I'll make sure to keep everyone posted!